Tired of not exercising because of your busy work schedule? Bring your work out to work! In honor of Health Literacy month we have started the Stair Climber Challenge. 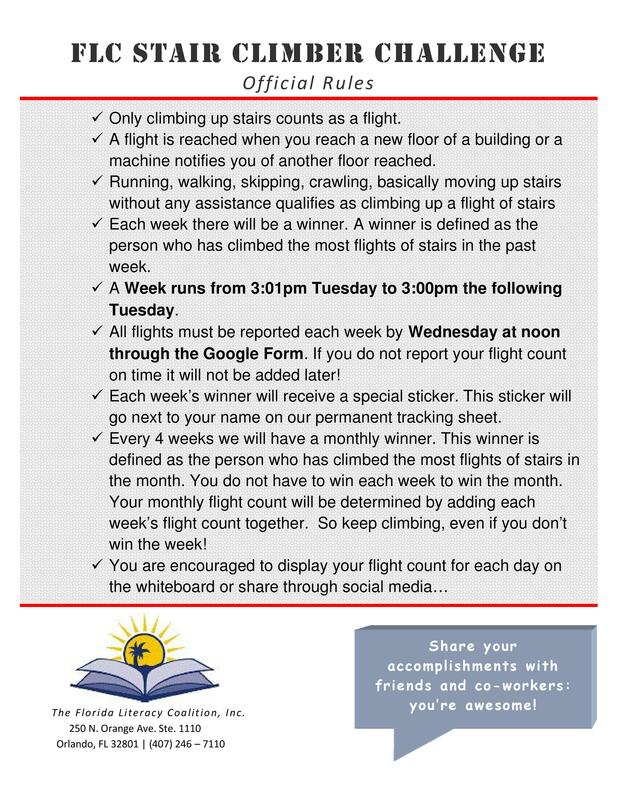 The SC Challenge is an office wide stair climbing competition. Incentives and prizes are distributed on a weekly and monthly basis to keep participants engaged. Building staircases and Stairmasters are acceptable stair climbing methods. Start a Stair Climber Challenge in Your Office! If you’d like to encourage your staff to keep a healthy and fit lifestyle by building exercise into their work-day, consider starting a SC Challenge in your office. You can view our rules below and tweak to better fit your organization’s needs. Taking the stairs can make a significant contribution to the 30 minutes of exercise we all need every day. The 30 minutes of physical activity we need for our health can be accumulated one stair flight at a time, spread out at intervals throughout the day. Physical activities like stair climbing are a great way to cope with job-related stress. Climbing just two flights of stairs everyday could result in a loss of 6lbs per year. Six flights a day could help you trim nearly 18 lbs. (results will vary based on other lifestyle/personal factors). Taking the stairs is often faster than waiting for an elevator during peak usage times. Take the test and time your trip. Often for trips of 7 floors or less, the stairs are the quickest way to your destination! Using the stairs requires no special skill, equipment or clothing and it burns twice as many calories as walking. So step right up! Join us on our Facebook page and share your Stair Climber stories. Showcase your accomplishments, weekly winners, or unique climbs that made your week! We look forward to staying healthy with you!